The forsythia is a popular shrub used for gardening across the country. The forsythia is very easy to grow and requires the least maintenance to thrive in your garden. The fiesta forsythia and the sugar baby forsythia usually bloom in the spring and are great ground covering plants that bring exotic beauty to your landscaping. Growing these plants is not difficult at all. However, there are a few guidelines that you should consider if you plan on uses the forsythia in your home garden. The dwarf forsythia has a minimal maximum height and is an excellent covering plant. The mature height in usually under a foot and can grow in some of the hardier growing zones. The sugar baby forsythia and the fiesta forsythia are ideal for adding some beauty to your home garden. The maximum height of these two bushes can range from one to two feet, and the width is usually a few feet as well. They fill bare areas very nice and can increase with the right amount of soil and fertilizer. If you are looking for dense coverage in your garden, these forsythia bushes give you just as much coverage in width as they do in height. The only type of fertilizer that is recommended on these forsythia plants is a rooting hormone. This fertilizer is rubbed on the stem of the recently planted bushes. This is just a healthy choice if you see the bush not fully grown. These forsythias are designed to flourish in hardy growing zones because of the strength of the rooting system. They thrive in both sunlight and shade conditions, so because they do have a significant mature height, you can plant these bushes anywhere your property needs a little color and beauty. Because these forsythia bushes grow more full than they do higher, you should allow up to five feet in between bushes to ensure when they reach their maturity that they do not grow into each other. You should try to keep these bushes away from foundations or concrete patios because the rooting system proliferates and is quite durable. The foundation could be endangered from the strength of the roots, so plant accordingly. The forsythia plant can be easily groomed as it matures, so sculpting of these plants is not a big chore. You can trim and prune them to any height you desire once rooting has adequately taken place. 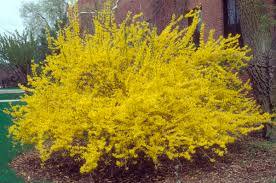 If your forsythia has problems blooming, it is possible that the bush has overgrown causing suffocation. If this is the case, you can quickly remedy that situation by taking one of the larger branches that still shows signs of significant growth, and bend the branch towards the ground. You need to ensure the end of the branch is covered in soil, leaving about six inches above the soil. The dwarf forsythia has a unique ground covering ability that allows it to fill in those areas of your landscaping that are having trouble keeping or growing shrubbery. They are extremely easy to maintain, and you can prune and shape the bush to any shape you like. The other types of forsythia bushes are a great alternative to the plants and trees that need constant maintenance to grow and thrive. Your home's landscaping will transform from drab and dreary to spectacular in a short period. These bushes will look splendid and splendid when they are in sprout. They likewise include heaps of shading amid the harvest time. They do extraordinary in clammy and all around depleted soils and will do fabulous when planted. They will have a beautiful green shading before they are in sprout. Forsythia Shrubs add loads of life to cultivates and different regions where they can be planted. Forsythia bushes give you extraordinary shading in the spring, as well as in the fall a long time also. In late-winter, your Gold Forsythias will create a wealth of splendid yellow blooms... motioning to everybody that spring has arrived. This botanical presentation against its dark green foliage is absolutely astonishing. You get another appearing of awesome shading in the fall, when its leaves turn splendid yellow with a trace of orange and red. Forsythias flourish in full sun or light shade, will develop in any dirt. They are very tolerant of the poor developing conditions and the poisons found in urban communities. Despite the fact that Forsythias aren't generally particular about their developing conditions, they will perform best when given ideal conditions. The dirt should be all around depleted. The expansion of peat greenery, treated the soil fertilizer, or garden compost to the current soil will get the plant off to a decent sound begin.Bigger assortments of Forsythias ought to be given a lot of room to develop, to completely value the magnificence of the common falling state of an example measured plant. Forsythia Shrubs are incredible to add to cultivates for shading. - Plant these trees in columns for a dynamic presentation of shading and amazing inclusion. - Plant only them as beautiful decorative plants. - Plant for inclusion as a protection screen or support. With a development rate of 2 to 4 feet for each year, your forsythia will rapidly fill any space, anyplace. These Gold Forsythias are for all intents and purposes joyful - you don't need to be a specialist to get extraordinary outcomes! Simply plant these bushes wherever you need huge amounts of shading... sit back... also, appreciate the show! We do prescribe a light pruning after the leaves have dropped to give it great shape and reliable development. Nothing can lift winter despair quicker than a look at the chipper daylight yellow sprout of forsythia. Its plenitude of bright yellow shading will turn into an indispensable piece of your yard and garden.